Beer, beer, beer. The social life of a geologist is filled with it. It’s glugged after a day studying rocks, after seminars and there was even a beer made specifically for a geological conference. Leanne Wiberg, a geologist and @craterlady on Twitter, was long swirling in this beer vortex until about 10 years ago when some geologists began sipping wine. While geologists “can channel rocks through wine,” not so with beer, which has ingredients–hops, water, etc– that are not location specific, she said. So when Leanne was working as a naturalist in Loudoun County, Va. she met a winemaker who asked her to apply her geological skills at a local winery on the weekends. Now Leanne hosts tours highlighting the nexus between science and winemaking at Doukenie Winery in Purcellville, Va. and she took some time after attending the Virginia Wine Summit to share with me why winemakers are nerds, the origins of Rkatsitelli grapes and wine tour patrons’ fascination with maps. WFTW: How can one apply science to winemaking? 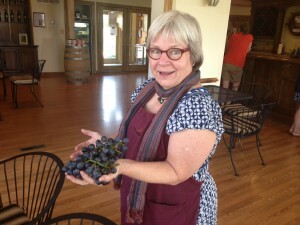 LEANNE: Winemakers are the classiest nerds and geeks you’ll ever meet. Technology and science is intrinsic to all vinification and vineyard management. Initially a site for any vineyard has to be selected. 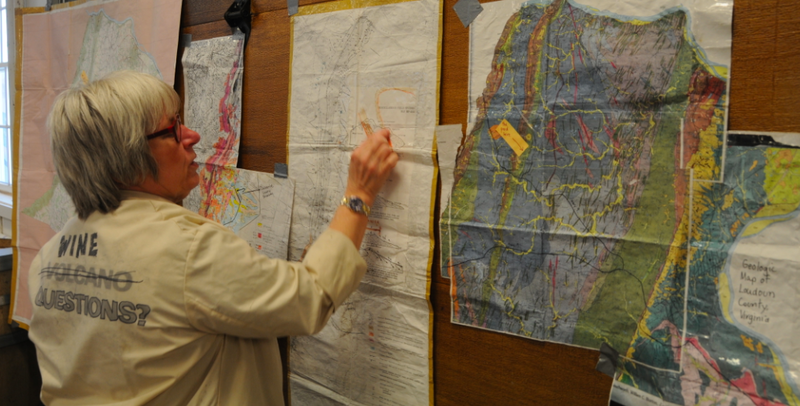 Considerations must be made: macro climate, elevation, topography, slope, solar aspect, and rock and soil types (geology) and former land use. Then the specific grape varietals have to be selected for the vineyard, based on these site selected. After that, the game plans about how to best care for the specific grapes in the vineyard and about when to harvest them must be done – all with the same mindful assessments that any successful farmer makes (yes farmers are scientists). The process of winemaking itself involves countless subjective judgements and objective measurements, all leading to irreversible decisions about how to proceed with fermentations and subsequent treatments (natural or commercial yeast, American or French Oak, malo-lactic conversion or not, addition of powdered tannins or not). As well, the process of bottling in itself is a technical minefield (bag-in-a-box systems or conventional bottles, natural or synthetic corks). The tools used by a viniculturist (winemaker) and viticulturist (grape grower) are the same as those used by a farmer, chemist, chef, microbiologist, plant geneticist, geologist, and geographer. 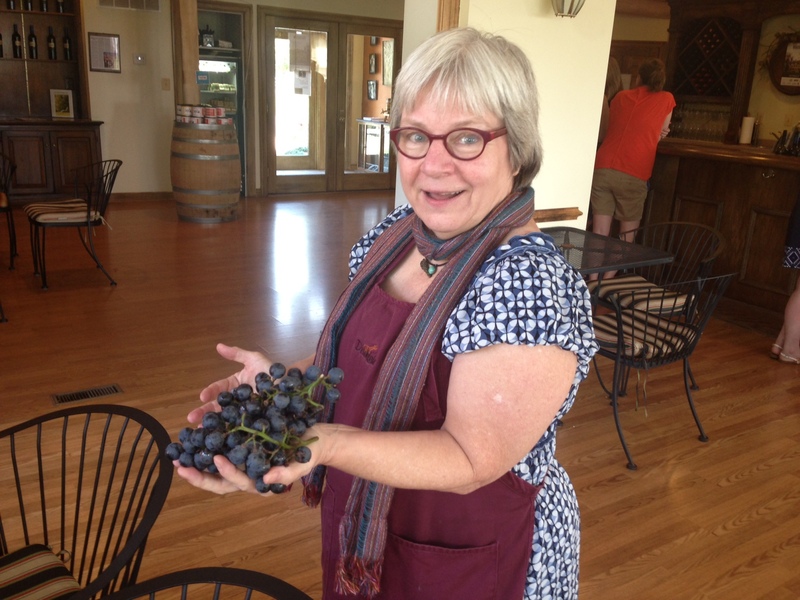 WFTW: What do people on your tours at Doukenie Winery find the most surprising? LEANNE: The tours don’t just discuss wines made at the winery. Rather, they present an overview of the entire Virginia wine industry, based on my eight years experience in it. In a very general sense, they are surprised to discover that Virginia wines overall taste as good as they do. As well, considering wines made at the winery where I work, many tour takers comment that varieties they generally avoided can taste more appealing when they are made using the traditional techniques used by winemakers from Burgundy (Doukenie’s winemaker trained in winemaking schools in Beaune and Macon in Burgundy, France). This winemaking style is not common in Virginia. Only one other winery in the state employs a winemaker trained in Burgundy – King Family Vineyards. Second, they are impressed by how non-traditional some of the wines are. Stereotypes based on wines originating in Europe and California are broken regularly in Loudoun County, especially. Unconventional blends appear because Virginia, as a nascent winemaking site, has not become entrenched in any particular style. For example, Tarara’s 2010 Honah Lee wine blends viognier, petit manseng, and rousanne – all grapes that might be new to Virginia wine. As well, they are surprised to learn that French-American hybrid wine grapes are on the radar of more and more local drinkers. Purposeful genetic crosses have been undertaken by breeders to produce wine grapes with increased disease resistance and climate suitability. For example, Desert Rose Winery is growing grapes called Crimson Cabernet. These grapes are a genetic cross between Norton (a grape hybrid itself growing well in the USA) with Cabernet Sauvignon (originally a European grape). Other hybrids include traminette, vidal blanc, chambourcin, and chardonel. 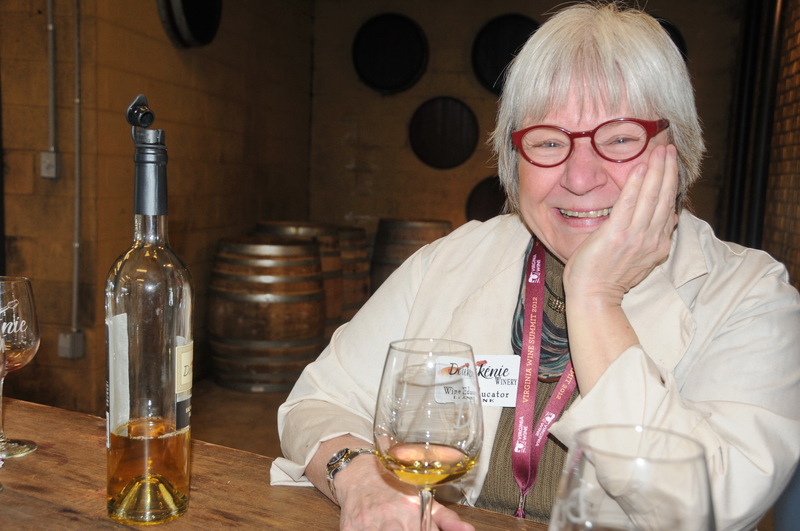 Because it is my “new” favorite white wine grape, my tour takers learn about Rkatsiteli – a grape originally from Uzbekistan, Turkmenistan, and Soviet Georgia which is making a fine showing in a small niche market locally…. 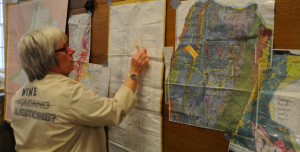 They are fascinated by the maps I use, which feature the geology, topography, and hydrology of the estate at Doukenie…. The tours include a vineyard circuit, a barrel room visit, and a guided “techno-tasting” involving six wines with an emphasis on interpreting how the vineyard setting and the specific winemaking practices influence the taste of each wine. It’s free for wine club members and $15 for non-members. Find out more at doukeniewinery.com. And if you’re wondering, Leanne’s favorite wines, other than Rkatsiteli, are Doukenie’s Petit Verdot, Merlot and Alsatian-style Riesling. ← Wine in a can? Wine in paper bottles? What’s up with that?